A chilly wind shortened our walk beside the lagoon, but there was enough time to take photos of these graceful, elegant birds. Two swans swam in tandem with their wings fluffed up. On another day, this gnarled Garry Oak, still leafless, made a striking view against the blue and white streaked sky. Oh great photos of the swans - we are so lucky that they over winter in our area. Love the tree. Swans are so beautiful. Love your images and collages. There is something so majestic and calm about swans. The swans are always so graceful and beautiful. Wonderful photos. There's not another bird that is a s graceful and lovely as a swan and these are wonderful photos! I also really like that tree...stunning. Your swan photos turned out well. The graceful swans are gorgeous and the Garry Oak certainly does make a majestic focal point. Thank you for linking to Mosaic Monday Lorrie. The swans are so pretty, lovely captures.. And I love that big old tree. Have a happy week! The swans look so beautiful and I like that gnarly tree a lot. It's snowing here this evening but looks quite pretty on the trees. The swans are so lovely...and regal! Have a great week. Beautiful swans and you are right about the tree. Gnarled trees seem to have a lot of character which maybe is why they make good pictures. It has gotten cold here again--and windy, as if winter was back. It won't last though, we can be sure of that! Oh the swans are so elegant and you captured them perfectly. Spotted swans a few weeks ago driving back up island from Victoria -- I'm always just a bit incredulous when I see them. They seem so magical, of a fairy tale, don't they? The swans are swimming in shallow water, which makes it much better for picture taking. Phew! Somehow I feel better that the large tree has no leaves yet. I thought everything was leafing and blooming there. There is also something magical in a tree during it's dormant time, like a skeleton silhouetted by the sky. Swans are such graceful creatures. What a lovely spot to walk. Oh, swans are such beautiful, graceful birds! Lovely photos! Swans are so elegant. Lovely photos! 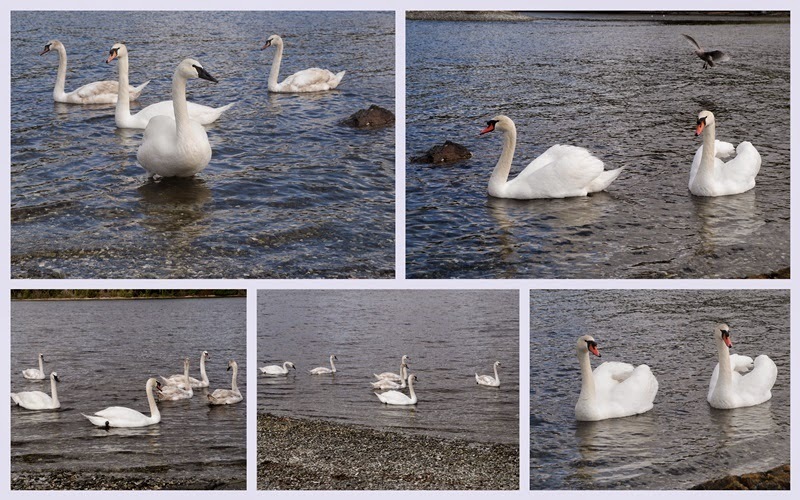 Lovely swan photos, well-off visiting the Esquimalt Lagoon when we visit Victoria. Love the shots of the swans, truly a majestic animal. They are so beautiful and regal. and there are lovely shades of blue in your photos. Lovely swans! I have seen them cover large parts of the river in the Yukon as they were migrating back North. What a neat gnarly tree. Swans are so beautiful that they leave me speechless.